A solar tornado churns on the face of the sun in this video captured by NASA's Solar Dynamics Observatory between Sept. 1 and 5. The view has been rotated counterclockwise from SDO's original view, so that the solar plasma tornado appears upright. A giant, swirling plume of superheated plasma churned above the surface of the sun for 40 hours last week while a NASA spacecraft looked on. NASA's sun-studying Solar Dynamics Observatory (SDO) captured dramatic time-lapse video of the solar tornado, which raged from Sept. 1 through Sept. 3. 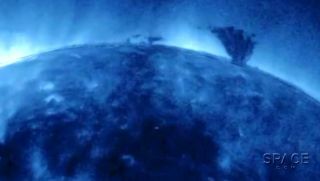 The mass of plasma "was stretched and pulled back and forth by powerful magnetic forces but [was] not ripped apart in this sequence," SDO team members wrote in a description of the video. "The temperature of the ionized iron particles observed in this extreme ultraviolet wavelength of light was about 2.8 million degrees C (or 5 million degrees F)." This isn't the first solar twister SDO has observed. Last year, for example, the spacecraft recorded video of an enormous tornado spinning off the sun. And in 2011, SDO watched as another tornado — this one about five times the size of Earth — gyrated at speeds of up to 186,000 mph (300,000 km/h). For comparison, tornado wind speeds here on Earth top out at around 300 mph (480 km/h). This image from NASA's Solar Dynamics Observatory captures a "tornado" swirling on the sun in early September 2015. The $850 million Solar Dynamics Observatory mission, which launched in February 2010, studies the sun with three different instruments, collecting data that help scientists better understand the solar magnetic field and space weather. SDO was the first mission launched under NASA's Living With a Star Program, which is probing the causes of solar variability, and the impacts of this variability on Earth.